Spheres of red and yellow lights descending from the outer path around the stupa enfold in their bright warmth all who’ve gathered this evening. In addition to the international sangha of ordained and lay people, there are also dignitaries who have come from afar to join in this celebration. The steps leading from the back gate down to the Bodhi Tree have been turned into a stage for the performances. Do not do anything that is wrong. Conduct yourself with utmost virtue. Following this is a short practice of the four-armed Chenrezik that includes chanting of Om Mani Padme Hum. Second is a group of Chinese monks and nuns in bright orange and yellow robes, who chant a supplication to the buddhas of the ten directions. Recorded music gives amplitude to the chant and at the end, they toss bits of metallic paper that catch the light as they fall to the ground. In gray and brown robes, the Korean monks and nuns chant a beautiful prayer recited when making offerings. One monk, who has a beautiful and moving voice, sings acapella for a while with the others bowing from time to time. Then they join in the singing with a close harmony that intensifies the feeling of devotion. The fourth group is composed of Vietnamese monks in burnt gold robes and carrying various small instruments: a bell on a stick, a wooden fish drum, a hand bell, and a small drum on a long handle that is tapped with a curved stick. They offer a captivating chant as their voices seem to move round in circles. They end with a very fast chant spurred on by the wooden hand drum. The Tibetan Institute for Performing Arts is represented by four women in front and four men in the back, all wearing the traditional Tibetan dress. His Holiness comments that they will sing a prayer that is an aspiration for the well-being of Tibet (Bo yul bde smon). In particular, it is dedicated for the well-being of those who suffered during this year’s disasters in Tibet. To the one thousand buddhas of this fortunate eon. And the gatherings of deities in the mandalas. And then become inseparable from Amitabha. And the deities of the Three Roots I’ve made this prayer. Please grant your blessings that it be quickly accomplished. 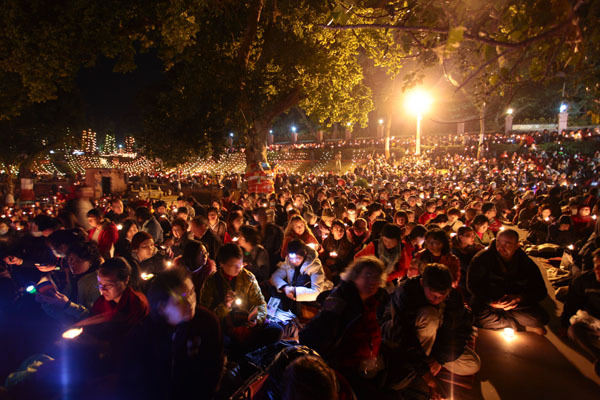 Then everyone lights their lamps: some are tea lamps in circular flower-petal holders made of simple pottery and other are flickering candles powered by batteries. 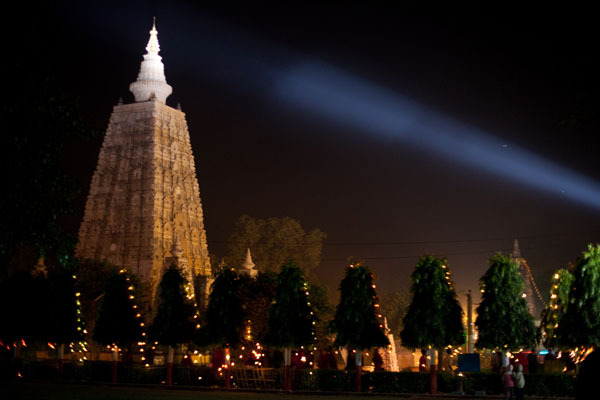 Once these lights glow throughout the darkness of the night, the Lamp Song is sung in Tibetan, English, and Chinese. After a request to remember the environment and carefully dispose of the lamps, His Holiness closes with the aspiration prayer that everyone enjoy a happiness that is unceasing. This entry was posted on December 27, 2010 at 9:31 pm and is filed under HH Karmapa, Teachings. You can follow any responses to this entry through the RSS 2.0 feed. You can leave a response, or trackback from your own site.